If I had to describe Rae Bryant’s collection The Indefinite State of Imaginary Morals in two words, the words would be these: damn impressive. These spots of humor are very welcome in a collection bursting with strong and often beautiful writing that lingers on themes of insecurity, power, and the perceived trappings of domesticity. The bulk of the protagonists in this collection are women, and Bryant wastes no time in flipping the script, so to speak. The opening stories present women playing the roles often assigned to men. In The Indefinite State of Imaginary Morals, Relatives and Gin, the main character escapes from a shallow post-coital encounter by crawling toward the door on all fours, and once she reaches the safety of a 7-Eleven, she muses on which relative she’ll kill should the man call. In Intolerable Impositions, the main character’s arm is pinned beneath the neck of a slumbering lover, and her only course of action for escape is to gnaw her own arm off. It’s funny and shocking, and it’s here that a great strength of Bryant’s writing is revealed. She has the ability to weave, seamlessly, in and out of fantasy. To witness it is truly jaw-dropping, and this weaving is presented best, I think, in Sublimity in Turquoise Blue, a longer, though brilliantly segmented story about an artist drowning in Mexico. Bryant’s writing is patient and controlled as she dunks our heads beneath the surface, subtly at first as she warms us up for longer submersions. In this way she earns our trust and rightfully so, because the things she shows us are gorgeous, but they’re dark, too, as well as painfully honest. The stories in this collection carry the weight of crumbling relationships, and the reality that people are ugly, needy, and sometimes smelly. They also carry the weight of our tendency as a culture to objectify women, notably in Fly Fishing in Neoprene Legs where it’s intimated that catching a woman is akin to catching a fish, or in the eerily futuristic or eerily contemporary Collecting Calliope where a father and son choose “built” women to satisfy their needs, or to fulfill an assumed rite of passage. The latter story is a satirical rendering of human trafficking, of women forced to perform in a male-dominated society. To me, the true standout story in this collection arrives somewhat early on. In Monk Man and Moonshine, a lengthy story about a young girl’s trials growing up in the Appalachian back-country, Bryant flexes every muscle in her creative arsenal. She squeezes character, scene, and setting to perfection. 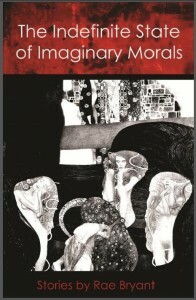 Purchase The Indefinite State of Imaginary Morals HERE.